Crossed Sabres Ranch, established in 1898, is one of the first operating dude ranches in the state of Wyoming. 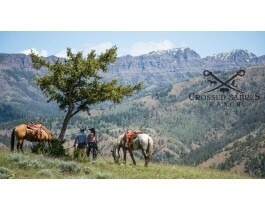 They are a full service dude ranch specializing in creating custom vacations of a lifetime. Their standard traditional dude ranch vacation is a six night, Sunday to Saturday vacation. In addition, they offer shorter stays with a minimum of three nights. They offer all-inclusive stays that can be as action packed or laid back as you choose. Guests of the Ranch will enjoy three hearty meals a day as they experience horseback rides, fly fishing, hiking, wildlife viewing or maybe just a quiet afternoon on the porch of their own intimate cabin. Located a short 8 miles from the East Entrance of Yellowstone, abundant opportunities to explore exist just steps outside their cabin doors. Open June-September 10th. No pets.